The coarse sand barrier has won first prize in the Flood Risk Management category of the 2018 Water Innovation Awards. On 29 November, Leo Voogt and Ulrich Förster picked up the award on behalf of the Rivierenland Water Authority and the POV programme (part of a research programme of Rijkswaterstaat’s National Flood Protection Programme). It was handed over by the Dutch Association of Regional Water Authorities and the Nederlandse Waterschapsbank. The Water Innovation Award helps the winners take the innovation forward in a booster programme with multiple options (testing and implementation, for example). The coarse sand barrier allows groundwater to flow below a dike but it stops backward erosion piping and therefore prevents the failure of the dike. When groundwater flows too quickly under a dike, more and more sand is flushed out of the base of the dike. And when too much sand is washed away, the dike will collapse completely. The idea now is not to build a broad berm behind the dike or to install sheet piling, but to introduce a barrier of coarse sand. Backward erosion piping mainly removes finer sand fractions. The coarser sand is less easily removed and so it acts as a barrier. In effect, the coarse sand barrier is a smart sand filter in the dike. The idea is an alternative to the traditional approach of building berms on the inner toe of a dike to prevent backward erosion piping. The coarse sand barrier prevents backward erosion piping, and therefore dike failure, in a natural way. Backward erosion piping is mainly a factor in the Dutch river area, where dikes are built on layers of clay on top of river sand: the Rivierenland Water Authority believes that half of all the dikes here are at risk. So this is a major challenge. 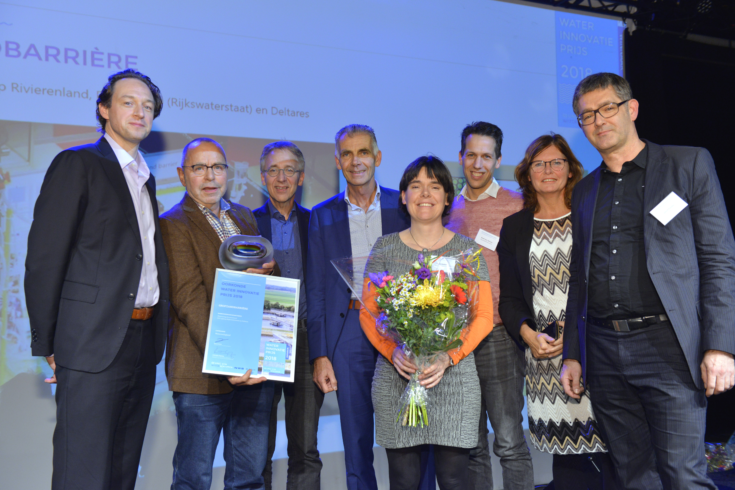 The innovation devised by Deltares received a grant from Rijkswaterstaat in 2017 for further development with the Rivierenland Water Authority and the POV piping programme. The effectiveness of the barrier has now been demonstrated in a test array at Deltares and in the Delta Flume. Working with a coarse sand barrier is faster, cheaper and more sustainable than the traditional approach. A coarse sand barrier can be installed quickly and no artificial materials are introduced into the soil. Until recently, a protective structure made of concrete, steel or synthetic material had to be installed on dikes where space was short. With the coarse sand barrier, that is no longer necessary and the cost savings are considerable.